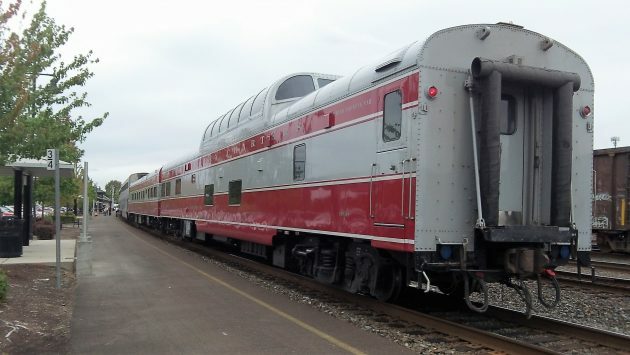 This car, Northern Sky, started out as dome car 9003, built in1955 for the Union Pacific. As I was passing Albany Station on my bike Thursday, the sight of two rail cars with a red and white paint scheme drew my attention. The cars were attached to the tail end of Amtrak’s Train 14, the northbound Coast Starlight. Later, I looked them up online and learned they represent pretty much the height of luxury in rail travel in a private car. 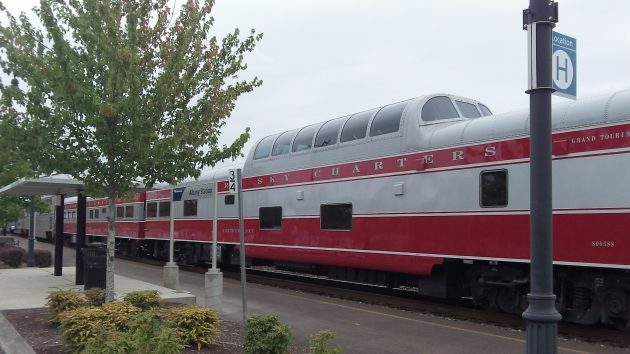 The cars are named Northern Sky and Northern Dreams and are operated by Northern Sky Rail Charters, based in Horseshoe Bend, Ariz. Groups or companies, or individuals, can rent them and go pretty much anywhere in the country where Amtrak operates its long-distance trains. Looking at their online calendar, they’re already booked for most of September. It’s not cheap, you will not be surprised to learn. I could not find a price list on the charter company’s website, but online there’s a video done by CNN that gives you an idea. The story has somebody saying the price is about $1,000 per day per person. The group of five people featured on the video was traveling from Chicago to Los Angeles, and from there to San Francisco and back to Chicago, and there was talk about paying $44,000 for the trip. For that kind of money, you and your fellow travelers get nicely furnished cabins with a bathroom and a queen-size bed, not to mention gourmet meals prepared by an on-board chef and served by a smartly dressed steward. And then you get to lounge in the observation area, look out the windows and watch America go by. Sounds like a lot of nostalgic fun. I’m sure my wife would love it.